Le Ferme de la Serraz - Jura & French Alps, France - Book online today! La Ferme de la Serraz Campsite - Surrounded by outstanding natural beauty. LUX-camp La Ferme de la Serraz offers a wonderful level of luxury camping in mobile homes, surrounded by outstanding natural beauty. Located within a hop and a skip of Lake Annecy in the Haute-Savoie, France's Rhône-Alpes region, the location is simply stuning. If your idea of a camping holiday includes great food, privacy and stunning nature all around your luxury mobile home, La Ferme de La Serraz Campsite is your ideal choice. Why should you choose a Camping Holiday at La Ferme de la Serraz Campsite? this luxury camping site boasts a heated swimming pool, sunbathing terrace with sun loungers and a toddlers' paddling pool. this holiday camping site offers bike hire, making exploration of Lake Annecy's surrounding villages easy. A nearby train station offers excursions further afield. 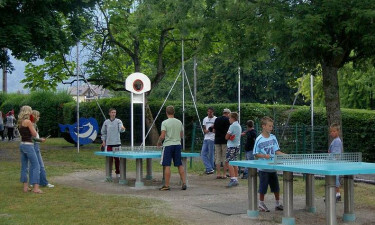 this LUX-camp also features a children's playground, games room and boules, to please little campers. both French and English are spoken by LUX-camp staff. Apart from the excellent onsite facilities already mentioned, there are numerous sightseeing opportunities just around the corner! Doussard is a lively little town on the banks of the southern side of Lake Annecy. The town is brimming with interesting historic architecture and attractions. Why not explore the town's lovely nature reserve, the Parc Natural des Buages, on a guided tour? Lake Annecy beach even offers paragliding and water sports club activities on the beach. Numerous cycle and hiking trails provide leisurely ways to be active and see the surroundings of the LUX-camp. In nearby Talloires, nature reserve Roc de Chere is awaiting your visit. A well-kept beach for water-skiing and sailing in Talloires Bay will please thrill seekers. Camping luxury for little guests means being close to attractions like the forest Adventure Park, which features four varied rope courses including one for kids over 5's. Four-legged family members are also welcome at this luxury camping site. With so many wonderful nature reserves, beaches and trails nearby, finding places to take dogs for walks won't be a problem! 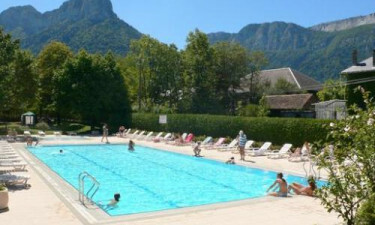 La Ferme de la Serraz Campsite is one of the family-friendliest camping sites near Lake Annecy - why not make it your base in the Haute-Savoie? A supermarket is located within a 450 metre walk in the village of Doussard. Within less than 7 km distance, campers will find an Intermarché and Carrefour Express. Local markets offer fresh produce throughout the week: market day is held every Monday in nearby Doussard and La Clusaz. 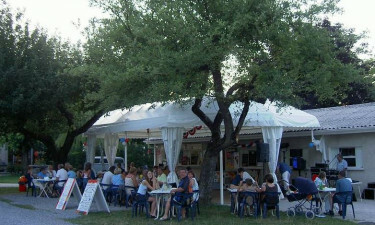 A bar and takeaway offer campers snacks and refreshment near the swimming pool, where both regional dishes and international cuisine like pizza and burgers are served. Occasionally, evening entertainment with live music or bingo will be offered. The village of Doussard has several bars and restaurants, a cinema and museum, all accessible within a few minutes.